Who doesn’t love an outdoor kitchen? They are among the most impressive backyard features around, and they are an instant value-adder. Of course, the best part about an outdoor kitchen is that it completely revolutionises your backyard. There’s nothing quite like entertaining around your outdoor kitchen and spending balmy nights cooking outdoors. We are lucky enough to live in one of the warmest climates in the world, so why not make the most of it by taking your cooking outside. Here’s how to create the ultimate outdoor cooking experience. Cooking under the stars is a romantic idea, but it also reduces the amount of time you can actually spend in your outdoor kitchen. By using a pergola, or other structure to enclose your outdoor kitchen, you create a space you can use 365-days a year. Cooking outside in summer is nice but cooking outside on a winter’s night is a real treat. Just make sure the structure is designed to be cooked in, which means including ventilation and constructing it out of fire-retardant materials. A fireplace is a perfect addition to an outdoor kitchen because, like a roof, it increases usability. You can also create a dual pizza oven/fireplace, so you create more than just a point of comfort and visual beauty, but another addition to your cooking repertoire. The most important aspect of an outdoor kitchen is the barbecue, and it’s something you should spend money on. Like everything else, you get what you pay for with a barbecue. If you buy a cheap four-burner, you’ll have something to cook sausages on for a couple of summers but don’t expect much use above and beyond that. The most important thing is ensuring it is made out of high-grade stainless steel. Remember, it needs to last through the elements. If you invest in your barbecue and maintain it, you can expect it to last for decades. You should also consider building your barbecue in, as this protects it from the elements and also creates a neater, cleaner look for your outdoor kitchen. There’s no point in bringing your cooking outside if you have to do all the preparation inside. If you have space, why not include a bench on at least one side of the barbecue. If you build an L-shaped design into a corner, you can create even more bench space. You can also have a sink plumbed in for more versatility. Have You Thought About Refrigeration? Eskies are the cornerstone of the outdoor dining experience, but they are also a bit of a pain. Someone always forgets the ice and has to make a trip down the store, they never really fit as much as you need them to and they’re not exactly a designer item. Instead of relying on ice in a box, why not deck out your outdoor kitchen with refrigeration. On top of just storing drinks, you can also free up your indoor fridge by storing meat and even salad items. If you have a pool, it’s natural to place your outdoor kitchen around the pool and blend it in with the pool landscaping. The other optimum placement is to blend your outdoor kitchen with your indoor space. The best way to do this is to divide the area with bi-fold doors, and even use the same flooring in the two spaces. By doing this, you blur the inside-outside line and make both sides of the door seem bigger and more visually interesting. You should also try and match the materials. For example, use the same benchtop material, try and use similar colour schemes and even match the furniture. Plants belong in every area of your backyard, including the kitchen. Plants tone down the area and give it life, especially if you’re using a lot of stainless steel. A bit of greenery will also improve air quality, and help to absorb some of that greasy, barbecue smell outdoor kitchens tend to accrue. If you really want to create something unique, why not use one of the walls as a green wall. They look incredible, they’re low-maintenance, and they can be upgraded and changed year-after-year. This applies to every part of your outdoor kitchen. 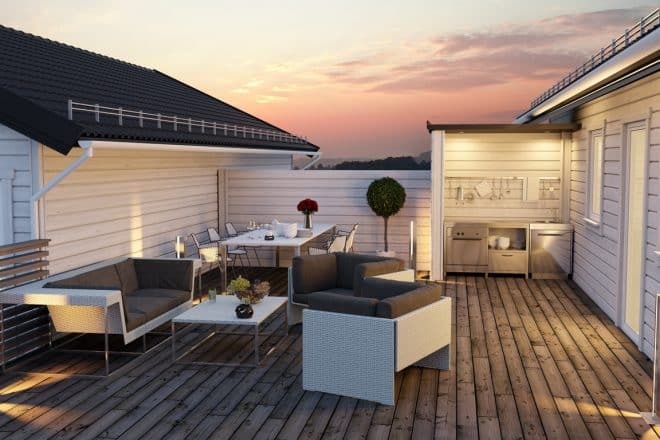 From the floor to the furniture, and of course the barbecue, everything needs to be designed to cope with the elements, high-traffic, oil spills, red wine swills and everything else you’d expect an outdoor area to deal with.